due to a complex of historical and cultural factors, the absolute and pure visual forms reached by malewicz and mondrian in the early 1910s have almost no influence on bulgarian modern art. should we exclude the achievements of georges papazoff and nikolay diulgheroff, who left the country in their twenties, and also the apocryphal stylisations of peter dochev and georgi yanakiev, one may well argue that bulgarian modernism is deprived of its natural integrity without a consciously held non-objective period. a prerequisite for the emergence of non-objective tendencies within the local art context can be found in the maturation of contemporary bulgarian civil society. on the other hand, this is a mutual process in which civil society is the principal beneficiary of the promotion of non-objective art forms. examples of such successful collaboration between society and non-objective aesthetics can be observed in countries like the netherlands, germany, france and switzerland, as well as in societies much closer to our political fate like poland, hungary, the czech republic and romania, where constructive and conceptual traditions date back to several decades ago. 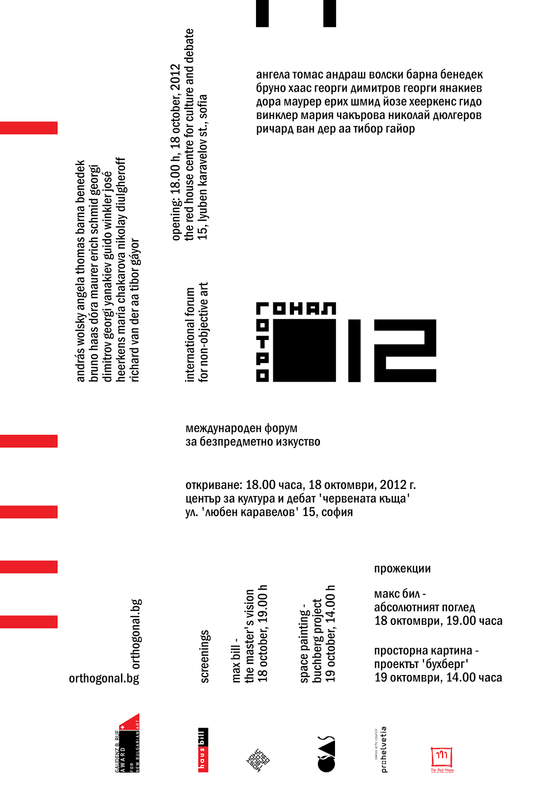 conceived as an international forum in 2011, orthogonal will introduce the bulgarian cultural public to a number of leading contemporary artists and theoreticians, who work in the field of non-objective art. apart from an exhibition of a variety of artifacts the event will offer a programme of open lectures and screenings which deal with contemporary and historical issues of this yet little known here art movement. nonsofia's ambition is that this forum becomes a regular art festival which will expand in the future and remain permanently on the bulgarian cultural agenda.